Children's Comics Library: a call for donations! I've technically come to the end of my residency at The Story Museum in Oxford, but I seem to be still hanging around the place a lot, between my weekly Comics Club there and a few exciting bits and pieces I've got planned before the Phoenix Children's Comics Festival in May. One thing we've talked about is putting together a bit of a permanent reading library of children's comics, which I think would be an absolutely fantastic thing - a collection of great comics from all over the world and all over the years that kids can just sit and peruse and read and get lost in. So: what we need is... well, comics. 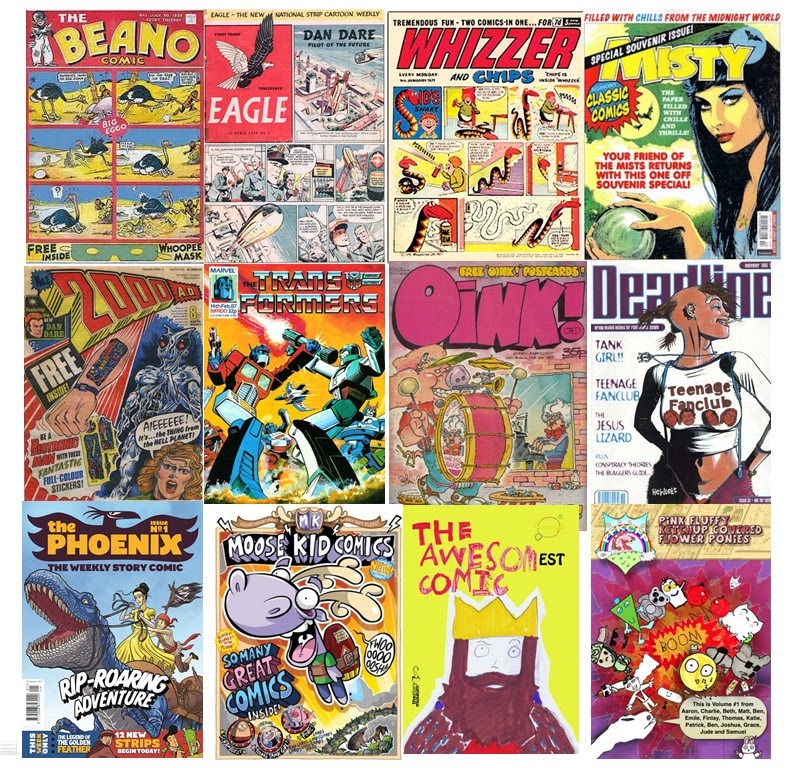 ALL child-friendly comics from all nations and eras are enormously welcome, but in the first instance what I'm really after is a range of British weekly comics of the 1970s / 80s. Not necessarily long runs of anything, just a couple of Mistys here, a couple of Victors there, a few Whizzer and Chipses in between. One of the upcoming activities I've got planned for Comics Club is all about anthologies, and it'd be really great to show kids something of the range of material, of genres and subject matters, that used to be available. I've got a bunch of early 2000ADs that I'll be donating myself, and it'd be great to have a load of other old comics to keep them company. If you do have any comics you'd like to donate to the museum, the best thing to do in the first instance would be to contact either me - on twitter or in a comment here - or the Story Museum directly, and then we can start to liase about details. Please spread the word, and thank you in advance! I'm giving a couple of talks on Writing Comics here and there these days, and I thought I'd put some of my resources up here for reference, so: for anyone interested in the process of How To Write Comics - or How I Write Comics, anyway, which is not necessarily the same thing - here you go. As an example we'll be taking the first episode of Tamsin and The Deep, a strip I write for the magnificently talented artist Kate Brown, which is published in The Phoenix. A cold November morning on a windy beach in Cornwall. It is largely deserted - all the holidaymakers are long gone for the year. The only people around are three local boys, surfing - impervious or steeled to the cold in their drysuits - and a young girl, who sits on the beach, grumpily watching them. The girl, Tamsin, argues with one of the boys - her older brother, Morgan. "You were supposed to be teaching me. You promised Mum!" "Alright, alright! In a minute…"
Morgan is too busy having fun with his Idiot Friends, and Tamsin is abandoned on the beach. Grumpily, she picks up her bodyboard and sets off to have a go herself, some way off, muttering as she goes about Stupid Morgan and his Stupid Idiot Friends. ...and wipes out. She is rolled around under the surf, managing to almost get back to the surface before being pulled down by a powerful undertow. The cord connecting her to her board snaps. She is dragged downwards, away from the sun and down, down into the dark. Morgan and his friends see her board bobbing around uselessly on the surface, and Morgan starts to scream helplessly. Arms gripping her legs, pulling her down. And just visible through the darkness, a terrible, beautiful, utterly alien face. That was pretty much one side of A4 for one episode. With something like Mega Robo Bros, where I'm writing for myself as an artist and I've been doing it for a while, the outline might be a lot shorter, but as this was an all-new strip and characters it goes into quite a lot of detail. 1.1: Small shot showing waves. 1.2: Big shot of Porthtowan beach. It is late November, the skies are slate grey and the sea dark, but that has not put off a small group of three teenagers: the dark-haired MORGAN and his idiot friends TRAVIS and KYLE, who are paddling their surfboards out into the waves. On the sands sits a ten-year-old girl, TAMSIN. Beside her are some bags and surfing-gear, left on the sands, and a couple of bodyboards. A large golden retriever, PENGERSEK, runs happily around on the sands behind her, chasing a ball. She is calling out to the group of boys on their surfboards. MORGAN: What IS it, Tamsin? 1.3: full-figure shot of Tamsin, so we get a proper look at her. She wears wetsuit and flippers; she is all kitted up with nowhere to do. She sits on her bodyboard, lain flat on the sand. Behind her, Pengersek runs around happily, chasing a ball. TAMSIN: You’re supposed to be teaching me! MORGAN: I will! In a bit, okay? KYLE: Dude, your sister is annoying. Do you really have to babysit her? 1.5: Close in on Tamsin, pulling a sulky face. 2.1: Medium shot. Her face set in determination, Tamsin picks up her bodyboard and strides off to panel right. 2.2: Arial shot, Tamsin strides along the beach, a trail of footprints behind her. Pengersek runs after her, yapping. TAMSIN: Don’t worry, Pengersek. Of course I’ll be careful. 2.3: Long shot of Tamsin striding out into the surf. In the distance we can see Morgan and his friends bobbing around on the surf, waiting for a big wave. 2.4: Tamsin paddles out, lying flat on her board now. TAMSIN: …how hard can it be, right? 2.5: Tamsin is now out in the sea, facing back towards the beach. She looks over her shoulder, out to sea. TAMSIN: Okay. So now I just wait for a big wave, right? 2.6: Shot from Tamsin’s POV of a wave approaching, in the distance. 2.7: Small shot of Tamsin, looking slightly worried. TAMSIN: ...that is a big wave. 2.8: similar shot to 2.6; the wave is much closer now, white foam breaking on the top of it. 2.9: Tamsin grips her board and looks up at the wave as it curls over her. 3.1: Large panel: Tamsin is doing it; riding the wave, speeding across the front of it on her boadyboard. She looks delighted. Sun glints on the waves. TAMSIN: Ha ha ha ha ha! I’m doing it! 3.2: Small panel of Morgan, some distance off; looking round. Possibly we can see Travis in shot, also looking off to the same point. TRAVIS: What’s she doing? She’s too far out! 3.2: Close in on Tamsin; she looks worried now; struggling to hold onto the board as the wave bears down on top of her. 3.3: Another large-ish panel; Tamsin WIPES OUT, the wave crashing down over her – just a limb or a tip of board being visible beneath the foam. 3.4: Wide shot of the beach; Off to the left we see Morgan surfing along, looking over to where Tamsin has disappeared beneath the water. Pengersek is splashing into the surf at the edge of the beach, barking furiously towards that same point. PENGERSEK: RUFF RUFF RUFF RUFF!! Tamsin is pulled down by the undertow. She flails wildly, uselessly. …setting up the big page-turn reveal for p4. But the precise sequence of events is less important here than the overall sensation – of panic, or chaotic turbulence, or rolling waves and darkness and impending drowning. 4.1: BIG panel. Still underwater, we see Tamsin being pulled down into the darkness by a HAND that grips her ankle. Between the darkness and the rolling waves and perhaps some seaweed it is hard to make out WHAT, exactly, it is. But we see a hand; a dark, greeny-blue hand. It grips Tamsin tightly by the ankle as she twists her body round in panic, looking down at it. 4.2: Close in on Tamsin’s face, looking down in panicked horror amongst the swirl of air bubbles. 4.3: Reverse-angle shot; Close in on an EERIE INHUMAN FACE looking up at her; female but fishlike; large black merciless eyes. Again, shrouded in darkness and seaweed and churning surf, but it is definitely a face. Back on the surface, a wide-angled shot of Morgan, running through the surf in panic, Pengersek at his side. Travis and Kyle are bringing up the rear, ineffectually. Morgan’s face is absolutely wild with terror. 4.5: Shot from Morgan’s POV of Tamsin’s bodyboard washing up in surf; its cord trailing uselessly behind it, attached to nothing. You'll note a couple of lines in red there: I think they were added in based on editorial feedback on the first draft; if memory serves, we just wanted to add a bit of clarity as to where Tamsin was relative to the boys, and hint that she was somewhere she shouldn't be. On the third page there's a section where instead of giving precise panel-by-panel script description, I've just described the general effect we're going for and left it up to Kate to make those decisions. When you are working with an artist and storyteller as talented as Kate, this is often a good idea. 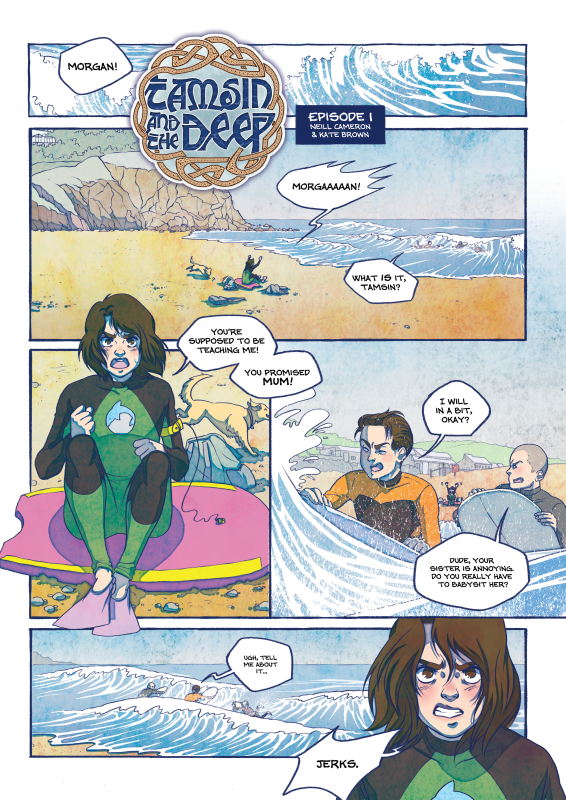 You can currently read the whole of Tamsin and the Deep chapter one over on Movella's Project Remix site - and maybe then have a go at creating your own comics, too. Do go have a look, and see for yourself the amazingly beautiful comic that Kate created out of all these boring old words. "Superbly engaging and utterly enthralling, this astounding all-action romp is a riotous delight of astonishing adventure." - Now Read This! ...but, as ever with comics, there's not a lot of money for advertising on the sides of buses and so forth (which is a shame because OH how I would love to see dinoships on the sides of buses) and we really do rely on word of mouth, so please... say words with your mouth? Thank you! You can see a bunch of art from the book and find out all about it over on my website, at www.neillcameron.com/pangaea, or read a preview on my tumblr. 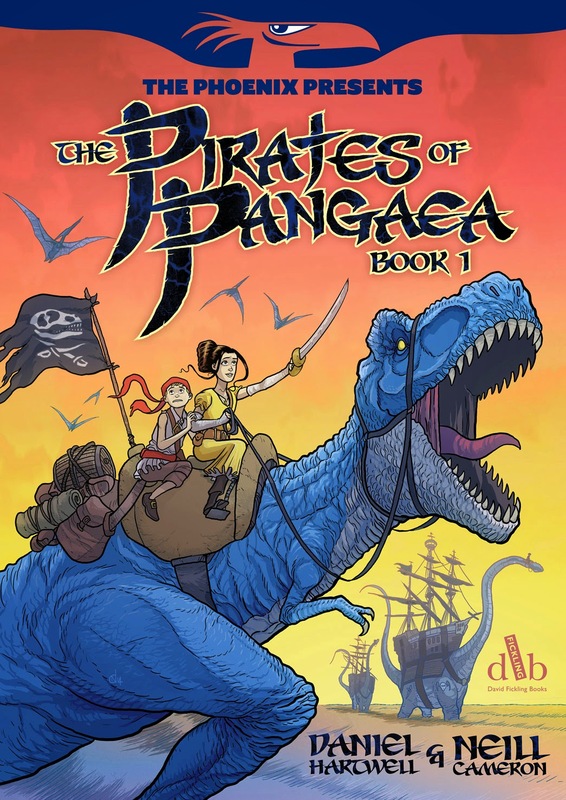 And look, you can now buy from those nice people at the Phoenix an exciting BUNDLE containing all three of my books (that's Pirates as well as Mo-Bot High and How To Make Awesome Comics) for a cut-down bargain price. I am mostly just excited to have somehow done enough books to constitute a bundle.